On the brink of deciding whether he’ll seek the Democratic presidential nomination, former Gov. Terry McAuliffe is being accused of flip-flopping on a bill that would have eased Virginia’s restrictions on late-term abortions. The criticism was leveled last week by Victoria Cobb, an anti-abortion activist who is president of The Family Foundation in Virginia; John Fredericks, a conservative radio talk show host; and several conservative websites . Virginia allows third-trimester abortions in hospitals if three physicians certify that a continued pregnancy would “likely” kill the woman or “substantially and irremediably” impair her mental or physical health. Legislation -- introduced in January by Del. Kathy Tran, D-Fairfax -- would have lowered the threshold from three physicians to one. That doctor would only have to certify that the pregnancy would damage a woman’s health. The “substantial and irremediable” threshold would have been repealed. The bill was killed this winter by Republicans ruling the House Courts of Justice Committee, a year after McAuliffe’s governorship ended. But it’s tremors have rocked Virginia politics. Tran, under tough questioning by Republicans during a Jan. 29 hearing, acknowledged that her bill would allow an abortion when a mother is dilating. During a year when all 140 General Assembly seats are on the ballot and partisan control is up for grabs, Republicans are planning to use the bill and Tran’s statement to argue Democrats support abortions almost up to birth. The governor’s words spurred Republican charges that Northam was backing infanticide, an accusation the Northam denounced. The comments reportedly spurred an outraged person to leak a picture from Northam’s page in his 1984 medical school yearbook showing one person in painted blackface and another in Ku Klux Klan garb. Northam worsened matters during a Feb.2 news conference when he denied that he was either person in the photo, said he didn’t know how the photo got on his yearbook page, offered that he had worn blackface once in medical school to appear as Michael Jackson, and seemed ready to demonstrate his Jackson-like “Moonwalk” before his wife dissuaded him. After the news conference, many of Northam’s fellow Democrats - including McAuliffe - called for the governor’s resignation. The next day, Feb. 3, McAuliffe made a national TV appeal for Northam’s resignation on CNN’s “ State of the Union.” Host Jake Tapper played Northam’s radio interview defending the late-term abortion bill. “Do you support this new legislation? And what was your reaction to the governor's comments there? “ he asked McAuliffe. McAuliffe took three minutes to answer. He said the purpose of the bill was to save pregnant women facing life-threatening circumstances in rural areas where it’s hard to find one doctor -- let alone three -- to approve a third-trimester abortion. The former governor accurately noted that only two third-term abortions have been reported to the state’s Department of Health since 2000. And he said efforts to “demonize” women undermine the state’s recruitment of businesses. Four times, Fredericks prodded McAuliffe to get to the point. “Governor, would you have vetoed the bill? Yes or no?” he finally asked. We asked Crystal Carson, McAuliffe’s spokesperson, whether the former governor’s position on the bill had changed. Her response was unclear. We should note that McAuliffe ran for governor in 2013 pledging to be “a brick wall” against efforts to diminish abortion rights. During his term, new members McAuliffe appointed to Virginia’s Board of Health repealed stringent building standards that had forced some abortion clinics to close. He also vetoed a bill that would have eliminated state funding to Planned Parenthood, a major abortion provider. On Feb. 3, McAuliffe said he would have “absolutely not” supported a bill that would have eased Virginia’s requirements for a third-third trimester abortion. In contrast, On April 1, he said he “would not have vetoed” the late-term bill if he’d been governor this year. He said a provision that would have lowered the number of doctors required to approve a third-semester abortion could save rural women whose lives are jeopardized by pregnancies. “I would support that. Sure I would,” he said. One bill, two polar positions. That’s a Full Flop. Legislative Information System, HB2491 , Jan. 28, 2019. Gov. Ralph Northam, Radio interview on WTOP , Jan. 30, 2019. Del. Kathy Tran, Comments to House Courts of Justice Subcommittee 4 , Jan. 28, 2019 (1:45 mark). Terry McAuliffe, Interview on CNN’s “State of the Union ,” (11:37 mark), Feb. 3, 2019 (11:37 mark). McAuliffe, Comments on The John Fredericks Show (36:56 mark), April 1, 2019. Victoria Cobb, Comments of The John Fredericks Show , April 2, 2019. The Republican Standard, “ McAuliffe Now Says He Supports Virginia’s Controversial Late-Term Abortion Bil l,” April 1, 2019. 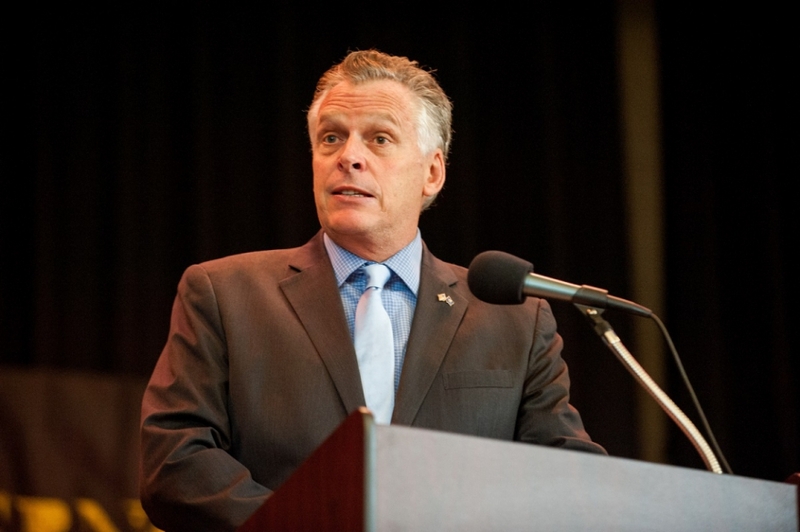 The Washington Free Beacon, “ McAuliffe Flips on Late-Term Abortion Bill, Calls it ‘Common Sense ’,” April 1, 2019. Email from Crystal Carson, spokesperson for McAuliffe, April 8, 2019. Time, “ Virginia Governor Challenges Abortion Clinic Regulations ,” May 13, 2014. The Virginian-Pilot, “ McAuliffe vetoes bill he says threatens Planned Parenthood ,” May 29, 2016.